To Sum It Up: A trip to Florida that ends in tragedy is only the beginning of a series of life-altering events for Emma McIntosh. She’s not aware of it yet, but she possesses a rare gift that marks her as one of the Syrena, undersea beings who can also take human form. Emma has already caught the attention of Galen, a Syrena prince who hopes that she will be able to maintain the peace between the two royal Syrena houses. But Emma won’t be so easily persuaded to just drop her life on land for one in the water, especially since she’s spent all these years not knowing who—and what—she really is. Review: This was my first foray into reading mermaid books, and let’s just say that I think I’ve had my fill of them for now. It’s tough enough mustering enthusiasm for a book when you don’t like any of the characters, even more so when you struggle with the writing, too. 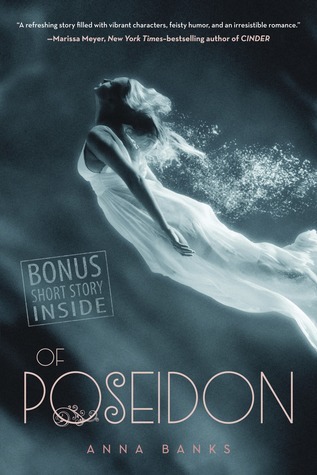 About all Of Poseidon had going for it was the novelty of mermaids/mermen, or Syrena, as they’re called here. Otherwise, it was yet another Awkward Girl Meets Super Hot Guy Then Gets All Melodramatic Over Him type of read. And I’m kind of tired of those. I probably should have taken the book’s beginning as a sign that we weren’t going to get along very well. If you and your best friend are floating around in Florida’s waters on a surfboard and your friend suddenly becomes alarmed because something brushed her leg, you at least take a quick look at your surroundings. You don’t dismiss your friend’s distress as her just joking around because she’s always been a prankster. You don’t do that because that’s a shark there in the water with you, ladies. And so began my frustration with Emma, the protagonist who thought her best friend, Chloe, was simply acting like her hilarious self. It wasn’t only Emma’s failure to realize that Chloe was in trouble until it was too late or her frequent exclamations of “Ohmysweetgoodness” that tried my patience. So many of her actions made me want to sit her down for a long chat about the benefits of exercising good old-fashioned common sense. When the hot guy you literally ran into down in Florida suddenly shows up as a student at your high school in New Jersey AND is in all the same classes with you, that’s when you run to file a restraining order. When you get a concussion, you don’t lie to your mom about being okay to drive then proceed to get behind the wheel of a car. Uh, how about some consideration for the safety of other motorists and pedestrians? And first you’re outraged (rightfully so, actually) over the Syrena custom that allows a male to be mated to a female without her consent, and then later, you’re giving the same male Syrena whom you disdained so deeply for forcing a female to be his mate advice on how to play hard to get with her? I could go on with the list of Emma’s mind-boggling behavior, but I’ll stop now. Given the male Syrena’s attitude toward their women, I can’t say I was fond of Galen, a prince of the House of Triton who believes that his royal title carries the same weight among humans as it does with the Syrena. At one point, Galen bemoans Emma’s refusal to listen to him and wishes that he could find a nice female who doesn’t answer back to look after him and pretty much cater to his every need. And that, right there, is why you’re alone, buddy. The book is written in both Emma’s first person perspective and in the third person whenever the focus shifts to Galen’s thoughts, and the two formed an odd combination. The first POV change was jolting; it took me a minute to figure out who was telling the story. I never did get used to the narrative style, either. I wouldn’t have minded alternating POVs if they’d been in the same person—first or third, not both. I hate to sound like I’m nitpicking the writing, but there were also some phrases that just seemed awkward to me. “He played me like an Xbox” rang with a certain dissonance to my ears. Toss in some refrains of “Ohmysweetgoodness” and, well, the prose really distracted me at times. The story of how the houses of Triton and Poseidon fell out with each other was interesting but all too brief. It might have made for a more fascinating tale than Emma trying to find her inner mermaid. And I’m fine with not knowing if she ever does or not because this series just isn’t for me. All in All: Sadly, Of Poseidon was disappointing all-around. But, like I always say when a book and I don’t see eye-to-eye, this was merely my experience with it. Hahaha, that water scene w/possible sharks is stupid. I saw this on sale at amazon, glad I didn't pick it up. I'm not much into mers too, I cant connect to their species. I feel bad about the rating, but barely anything about this book worked for me. And seriously, if you're going out into Florida's waters, you need to be aware of your surroundings at all times. Hah, yep. There are so many things wrong with this book, mostly the sexism. Like...what? How did that nonsense get published? I mean, the book is almost entertaining, in a mindless way, but Galen and his merperson buddies pretty much ruin it. Galen's griping about not being able to find a submissive mate was just too much, as was Emma first being appalled by Galen's friend being mated to Galen's sister without her approval then KISSING the friend to make her jealous. I definitely can't read any more about this bunch. I'll have to check into the Jackson Pearce book. I love the Disney version of The Little Mermaid, which is still the only mermaid tale I've ever liked. This one . . . not so much. I'm kind of glad that this is the first month that I wasn't able to do my paranormal read. The mermaid books don't appear to be that entertaining. The POVs seems so crazy. I don't think I could handle all the crazy decisions either. Great review! Jaclyn @ JC's Book Haven. I picked this one for the Paranormal Reading Challenge because it was the first mermaid book that came to mind, and I think I should have just skipped this month's read all together. The way the POVs were written was quite confusing and further added to my list of gripes about this book. I probably should have DNF-ed this, but there was a tiny part of me that was curious enough to see it through to the end. Emma and Galen both had me shaking my head at them often; I guess in a way, they're perfectly suited for each other.